“India’s aspirations to become a permanent member of the UN security council is realistic and doable”, says, Hardeep Singh Puri, Minister of Housing and Urban Affairs during his conversation with Ambassador P.S. 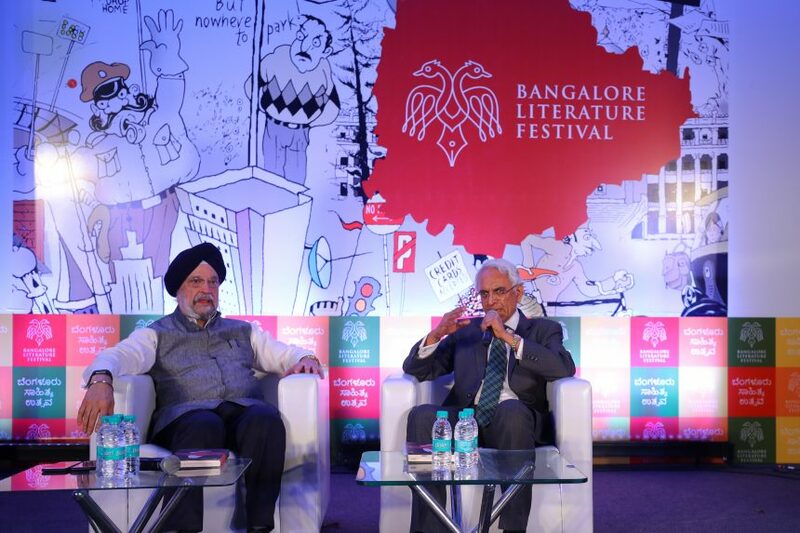 Raghavan at the Bangalore Literature Festival. The session was on the back drop of his book ‘Perilous Interventions: The Security Council and the Politics of Chaos’. Having had a 40 years long momentous career in diplomacy, the Minister spoke about his time in the UN Security council as representative of India and India’s diplomatic relationship with major countries across the globe. The Ambassador asked if India could contribute to the decision making and make difference during his two years tenure in the UN Security Council. He says, “those 2 years were different from any other period because that what was when the western liberal democratic model was being introduced to areas like Libya and Syria which are alien to the model itself”. The period also saw application of military forces, arming rebel groups etc. India was playing from within the ring and did try to make a difference. But there are other countries which act as if they know the best which has resulted in the consequences. When asked about India-Pakistan cooperation at the council, the Minister said that though India and Pakistan had major differences, they worked together on many other international issues. Speaking of the permanent members of the UNSC, he says, it is justifiable that the US and China, the two huge economies of the world are permanent members. But there are at least two member countries which do not deserve to be there. The current membership in the permanent council still reflects the world of 1945 and not the current times. It is surprising that Germany, which is a bigger economy from Europe Zone has not been considered for the permanent membership. As for India’s aspirations to be a permanent member, we must shed our cautiousness and jump into the arena. Unless you get into the arena, we will not get it because the permanent members would never agree to dilute their veto powers. In August 2011, during India’s presidency in the UNSC, India was instrumental is passing a unanimous framework resolution demanding all disputants including the government to walk back in Syria. For every one person killed in these zones, 10 end up in AL-Qaeda or the ISIS. He says, he was hoping that the US-Russia relationship would be reset after President Trump’s win. However, the State departments of the US are not in line with the President which is a major inhibitor in improving the relationship. This proxy war between US and Russia also affects the situation in Afghanistan. The Minister who was the Indian diplomat in SriLanka when the IPKF (Indian Peace Keeping Force) happened says, most people did not understand the IPKF fully and could not appreciate what they did for Sri Lanka. Both sides did make their share of mistakes but the agenda of IPKF was not to create a separate Eelam for Tamils but to ensure their rights are protected in the unified Sri Lanka. According to him, even today, India’s strategy in SriLanka is the most viable one. The massive investments by Chinese government cannot be sustainable for diplomatic relations. When questioned about India’s stand on Rohingya, the minister opines that India’s stand is a mature stand. India has always been kind towards refugees and in this case the orientation towards terrorism makes it difficult. “The criticism against India on this aspect is unfair”, says the Ambassador since we are not creators of the problem in Myanmar unlike in Syria. The minister suggested the Ambassador who has been appointed as Convener of the National Security Advisory Board of the National Security Council of India should persuade the Indian side to play mediators for the US and Russia. He also insists that it is time to have a conversation with North Korea which has now demonstrated itself as a nuclear power. Major nuclear powers need to act with the maturity that they are nuclear powers and should not engage in bush wars. In the words of the Minister, no country in the world is better placed than India to play such a role even with Iran or North Korea.